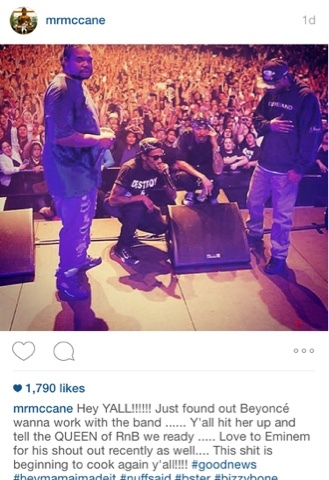 RAW HOLLYWOOD : BEYONCÉ SET TO COLLABORATE W/ BONE THUGS-N-HARMONY? BEYONCÉ SET TO COLLABORATE W/ BONE THUGS-N-HARMONY? Could Beyoncé be cooking up some new hits for her next studio album? She has her eyes set on collaborating with 90's hip-hop group Bone Thugs-n-Harmony. For those of you who may not be familiar with their music, they've had a lot of success & their debut album Faces of Death was released back in 1993 & sold 17 million units throughout the United States. As Queen Bey begins to construct the sound of the follow-up to the 2013 self-titled album she has desires to work with the iconic rappers. Bizzy Bone made the exciting announcement on social media expressing that they are ready to collaborate with the Grammy winner.